For the 4th Duke of Somerset, see Edmund Beaufort, 4th Duke of Somerset. Edmund Beaufort, 2nd Duke of Somerset,[a] KG (c. 1406 – 22 May 1455), was an English nobleman and an important figure in the Wars of the Roses and in the Hundred Years' War. He also succeeded in the title of 4th Earl of Somerset and was created 1st Earl of Dorset and 1st Marquess of Dorset (previously held by his father and later forfeited), and Count of Mortain. He was known for his deadly rivalry with Richard of York, 3rd Duke of York. Edmund Beaufort was the third surviving son of John Beaufort, 1st Earl of Somerset, and Margaret Holland. His paternal grandparents were John of Gaunt, and Katherine Swynford. His maternal grandparents were Thomas Holland, 2nd Earl of Kent and Alice FitzAlan. Alice was a daughter of Richard FitzAlan, 10th Earl of Arundel and Eleanor of Lancaster. Edmund was a cousin of both Richard, Duke of York and the Lancastrian King Henry VI. Although he was the head of one of the greatest families in England, his inheritance was worth only 300 pounds. By contrast his rival, Richard, Duke of York, had a net worth of 5,800 pounds. His cousin King Henry VI's efforts to compensate Somerset with offices worth 3,000 pounds only served to offend many of the nobles and as his quarrel with York grew more personal, the dynastic situation got worse. Another quarrel with the Earl of Warwick over the lordships of Glamorgan and Morgannwg may have forced the leader of the younger Nevilles into York's camp. His brothers were taken captive at the Battle of Baugé in 1421, but Edmund was too young at the time to fight. He acquired much military experience while his brothers were prisoners. In 1427 it is believed that Edmund Beaufort may have embarked on an affair with Catherine of Valois, the widow of Henry V. Evidence is sketchy, however the liaison prompted a parliamentary statute regulating the remarriage of queens of England. The historian G. L. Harriss surmised that it was possible that another of its consequences was Catherine's son Edmund Tudor and that Catherine, to avoid the penalties of breaking the statute of 1427–8, secretly married Owen Tudor. He wrote: "By its very nature the evidence for Edmund Tudor's parentage is less than conclusive, but such facts as can be assembled permit the agreeable possibility that Edmund 'Tudor' and Margaret Beaufort were first cousins and that the royal house of 'Tudor' sprang in fact from Beauforts on both sides." Edmund surrenders to Charles VII at Rouen in 1449. Illuminated page from the Anciennes chroniques d'Angleterre, Jean de Wavrin. Edmund received the county of Mortain in Normandy on 22 April 1427. Edmund became a commander in the English army in 1431, and in 1432 was one of the envoys to the Council of Basel. After his recapture of Harfleur and his lifting of the Burgundian siege of Calais, he was named a Knight of the Garter in 1436. After subsequent successes he was created Earl of Dorset on 28 August 1442 (though he seems to have been styled as such since around 1438) and Marquess of Dorset on 24 June 1443. During the five-year truce from 1444 to 1449 he served as Lieutenant of France. On 31 March 1448 he was created Duke of Somerset. As the title had previously been held by his brother, he is sometimes mistakenly called the second duke, but the title was actually created for the second time, and so he was actually the first duke, the numbering starting over again. Somerset was appointed to replace York as commander in France in 1448. Fighting began in Normandy in August 1449. Somerset's subsequent military failures left him vulnerable to criticism from York's allies. Somerset was supposed to be paid £20,000; but little evidence exists that he was. He failed to repulse French attacks, and by the summer of 1450 nearly all the English possessions in northern France were lost. By 1453 all the English possessions in the south of France were also lost, and the Battle of Castillon ended the Hundred Years War. The fall of the duke of Suffolk left Somerset the chief of the king's ministers, and the Commons in vain petitioned for his removal in January 1451. Power rested with Somerset and he virtually monopolised it, with Margaret of Anjou, wife of Henry VI, as one of his principal allies. It was also widely suspected that Edmund had an extra-marital affair with Margaret. After giving birth to a son in October 1453, Margaret took great pains to quash rumours that Somerset might be his father. During her pregnancy, Henry had suffered a mental breakdown, leaving him in a withdrawn and unresponsive state that lasted for one and a half years. This medical condition, untreatable either by court physicians or by exorcism, plagued him throughout his life. During Henry's illness, the child was baptised Edward, Prince of Wales, with Somerset as godfather; if the King could be persuaded, he would become legal heir to the throne. Somerset's fortunes, however, soon changed when his rival York assumed power as Lord Protector in April 1454 and imprisoned him in the Tower of London. Somerset's life was probably saved only by the King's seeming recovery late in 1454, which forced York to surrender his office. Henry agreed to recognise Edward as his heir, putting rest to concerns about a successor prompted by his known aversion to physical contact; subsequently he came to view Edward's birth as a miracle. Somerset was honourably discharged, and restored to his office as Captain of Calais. By now York was determined to depose Somerset by one means or another, and in May 1455 he raised an army. 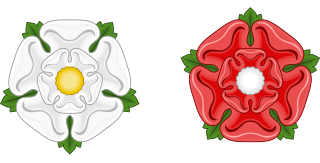 He confronted Somerset and the King in an engagement known as the First Battle of St Albans which marked the beginning of the Wars of the Roses. Somerset was killed in a last wild charge from the house where he had been sheltering. His son, Henry, never forgave York and Warwick for his father's death, and he spent the next nine years attempting to restore his family's honour. Edmund married sometime between 1431 and 1433, Eleanor, daughter of Richard de Beauchamp, 13th Earl of Warwick and his first wife, Elizabeth, (daughter and heiress of Thomas de Berkeley, 5th Baron Berkeley). Eleanor was an older half-sister of Henry de Beauchamp, 1st Duke of Warwick and Anne Neville, 16th Countess of Warwick. Eleanor Beaufort, Countess of Ormond (between 1431 and 1433 – 16 August 1501), married firstly James Butler, 5th Earl of Ormond and secondly Sir Robert Spencer, of London and Bridport, Dorset. Joan Beaufort (1433 – 11 August 1518), married firstly Robert St Lawrence, 3rd Baron Howth and secondly Sir Richard Fry. Anne Beaufort (1435 – 17 September 1496), who married, Sir William Paston (1436 – before 7 September 1496), a younger son of William Paston (1378–1444), Justice of the Common Pleas. Margaret Beaufort, Countess of Stafford (1437–1474), married firstly Humphrey, Earl of Stafford and secondly Sir Richard Darell, of Littlecote (in Ramsbury), Wiltshire. Elizabeth Beaufort (1443 – before 1475), married Sir Henry Fitz Lewis. 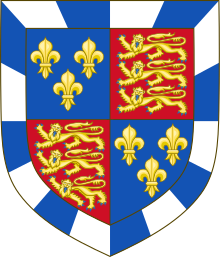 As Duke of Somerset, Edmund Beaufort's arms were the Royal Arms of England within a bordure compony argent and azure. ^ He was actually the first Duke of Somerset of the second creation of that title, his elder brother's title being extinct. ^ a b Cokayne & White 1953, p. 49. ^ a b One or more of the preceding sentences incorporates text from a publication now in the public domain: Kingsford, Charles Lethbridge (1911). "Somerset, Edmund Beaufort, Duke of" . In Chisholm, Hugh (ed.). Encyclopædia Britannica. 25 (11th ed.). Cambridge University Press. p. 386. ^ Cokayne & White 1953, p. 49–50. ^ Cokayne & White 1953, p. 50. ^ Richardson 2011, p. 43. ^ Cokayne & White 1953, p. 51. ^ Norton, Elizabeth (2012), Margaret Beaufort: Mother of the Tudor Dynasty, Amberley Publishing, ISBN 1445607344 , Chapter 3. ^ Ashdown-Hill, John (2015), The Wars of the Roses, Amberley Publishing, ISBN 1445645327 , Chapter 3. ^ a b c d e f Alison Weir, Britain's Royal Family: A Complete Genealogy (London, U.K.: The Bodley Head, 1999), page 106. ^ The Lineage and Ancestry of H.R.H. Prince Charles, Prince of Wales, by Gerald Paget, Vol. I, p. 23. ^ Davis 1971, p. lvii. ^ a b c d Alison Weir, Britain's Royal Family: A Complete Genealogy (London, U.K.: The Bodley Head, 1999), page 105. ^ The Complete Peerage of England, Scotland, Ireland, Great Britain, and the United Kingdom, by George Edward Cokayne, Vol. II, p. 422. ^ a b c d Brown 2004. ^ Weir 2008, pp. 94, 125. ^ a b c Weir 2008, p. 93. ^ a b c Weir 2008, p. 125. ^ a b c Weir 2008, p. 77. ^ a b Browning 1898, p. 288. ^ a b Weir 2008, pp. 94–95. ^ a b Weir 2008, pp. 97, 104. Cokayne, G. & White, G.H., eds. (1953). The Complete Peerage. 12.1 (2nd ed.). London: St. Catherine Press. Davis, Norman, ed. (1971). The Paston Letters and Papers of the Fifteenth Century, Part I. Oxford: Clarendon Press. Retrieved 20 September 2013. Farquhar, Michael (1 May 2001). A Treasury of Royal Scandals: The Shocking True Stories History's Wickedest, Weirdest, Most Wanton Kings, Queens. Penguin Books. ISBN 978-1-101-01039-6. Richmond, Colin (2008) . "Beaufort, Edmund, first duke of Somerset (c. 1406–1455)". Oxford Dictionary of National Biography (online). doi:10.1093/ref:odnb/1855. Missing or empty |url= (help) First edition available at Wikisource: Tipping, H. (1885), "Beaufort, Edmund" , in Stephen, Leslie (ed. ), Dictionary of National Biography, 4, London: Smith, Elder & Co .
Weir, Alison (18 December 2008). Britain's Royal Families: The Complete Genealogy. London: Vintage Books. ISBN 978-0-09-953973-5. Thomas Clifford, 8th Baron de Clifford, also 8th Lord of Skipton, was the elder son of John, 7th Baron de Clifford, and Elizabeth Percy, daughter of Henry "Hotspur" Percy and Elizabeth Mortimer. Ralph Neville, 3rd Earl of Westmorland was an English peer. He was the grandfather of Ralph Neville, 4th Earl of Westmorland. Sir Robert Spencer (d.pre-1510) "of Spencer Combe" in the parish of Crediton, Devon, was the husband of Eleanor Beaufort (1431–1501), the daughter of Edmund Beaufort, 2nd Duke of Somerset (1406–1455), KG, and was father to two daughters and co-heiresses who made notable marriages.